SAN FRANCISCO — Established in 1968, the Northern California Cherry Blossom Festival serves to cultivate the continued alliance between Japan and United States using culture as its bridge. Each year, over 220,000 people attend this dazzling display showcasing the color and grace of the Japanese culture and the diversity of the Japanese American community. The 51st annual Northern California Cherry Blossom Festival will be held on Saturday and Sunday, April 14-15 and 21-22. The festival will be held within the borders of Laguna and Fillmore streets between Geary Boulevard and Bush Street. There will be food booths, musical and dance performances, martial arts, live bands, and more. Ongoing cultural displays and demonstrations will feature bonsai, suiseki (natural stone artwork), chanoyu (tea ceremony), ikebana, doll-making, Japanese pop culture, swords, karuta (poetry card game), kendama (traditional Japanese toy), origami, shishu (embroidery), and shodo (calligraphy). Festival highlights include the following. • The Northern California Cherry Blossom Queen Program is dedicated to mentoring young women so they may develop the leadership skills and community connections necessary to promote not just stronger individuals, but also a stronger community. The event will be held on Saturday, April 14, at 6 p.m. at the AMC Kabuki 8 Theater on Post between Webster and Fillmore. • Sakura 360 honors the modern “360 degree” fusion of pop-culture exchange between Japan and America, involving anime, gaming, fashion, music and dance. Visitors are invited to enjoy and participate in contests, activities, live performances, and exclusive merchandise. This year, Sakura 360 will be located on Buchanan between Sutter and Bush both weekends, featuring a new Artists Alley with artists inspired by Japan’s pop culture. • The second annual Cherry Blossom Film Festival showcases nine of Japan’s best films and anime, reflecting the diverse and unique legacy of Japanese cinema. Screenings will be held on April 14-15 and 21-22 at New People Cinema, 1746 Post St.
• “Kabuki Hayashi: Sound of Japan” on Sunday, April 15, at 1:30 p.m. (doors open at 12:30 p.m.) at AMC Kabuki 8. Tickets: $15 at the door. Supported by Soke Nishikawa Kai California and Toyokuni Sumie Doodle from Tokyo. • Friendship Reception, a dinner and gathering to welcome guest participants from Japan and Hawaii, on Friday, April 20, at 6:30 p.m. at Hotel Kabuki, Post and Laguna. Registration at 6 p.m. Tickets: $35 at the door. Best opportunity to catch their performances in one evening. • Cherry Blossom Taiko Festival on Saturday, April 21, at 7 p.m. at Japanese Cultural and Community Center of Northern California, 1840 Sutter St. Featuring Grandmaster Seiichi Tanaka and San Francisco Taiko Dojo with special guest Sacramento Taiko Dan. Tickets: $30 for adults, $25 for students and seniors. • Senior Appreciation Brunch on Sunday, April 22, at Hotel Kabuki, Post and Laguna. The Northern California Cherry Blossom Festival’s Senior Appreciation Brunch started 30 years ago to thank seniors in the local Japanese American community for their volunteer services. Each year, honorees are nominated by senior centers and receive certificates of commendation from elected officials. Following the brunch, they are recognized at the Peace Plaza Stage. 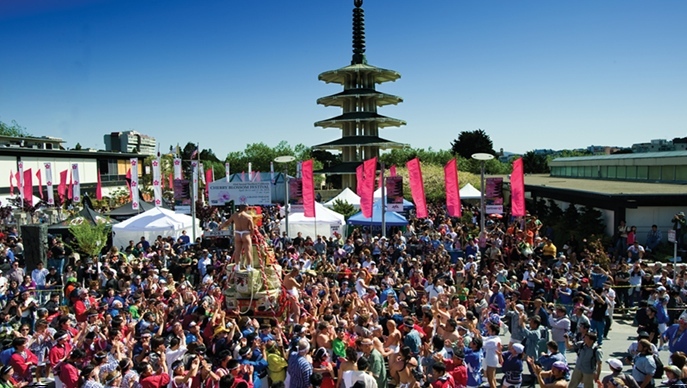 • The Grand Parade begins at the Civic Center on Sunday, April 22, at 1 p.m., proceeding up Polk to Post Street, and ending in Japantown at Post and Fillmore streets. A number of performers from Japan will participate. Japanese classical (buyo) and folk dance (minyo) groups representing the Bay Area will perform throughout the parade route. Boy Scout troops from the Japanese American communities will march proudly along the streets. Streams of colorful floats will be carrying young women representing Japanese American and other Asian American communities. World-renowned San Francisco Taiko Dojo will keep the parade upbeat with the thundering sound of drums, and this year’s queen and her court will cascade their way to Japantown. Anchoring the parade is the exciting Taru Mikoshi, which will be hoisted by over 100 strong individuals from throughout the Bay Area. This year’s grand marshal is figure skating and “Dancing with the Stars” champion Kristi Yamaguchi. The community marshals are civil rights attorneys Dale Minami and Donald Tamaki. For a complete schedule, visit https://sfcherryblossom.org/.